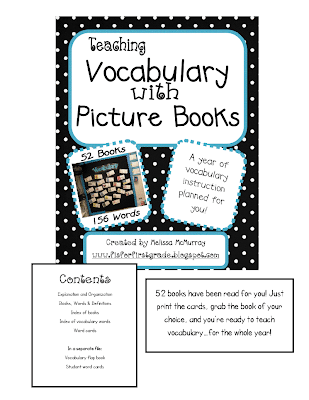 I just have to share this fabulous idea for teaching vocabulary. Thanks to Melissa at F is for First Grade for creating this little gem! As we all know, we have less & less opportunities to read to the kids just for fun. So Melissa pulled out those standard favorite read alouds & decided to use them to teach vocabulary. She chose three words from each book, created super cute cards for each book, used them all in a bulletin board, & developed a really cool way to teach vocabulary! Here are some pics of the bulletin boards & the cards. This wonderful resource is available at Melissa's TpT store. Check it out! Hi Brenda! We loved this vocabulary bulletin board and featured it at our blog, Bulletin Board Ideas! We were sure to give idea/photo credit, as well as a link back to your blog, but we'd love for you to take a look at it and if there are any problems, we'll be sure to take the feature down immediately!